I cannot wait for Thanksgiving! You know why? My son will be home from University for 4-1/2 whole days! He's a freshman...and it's been an adjustment for all of us...mostly me! I cannot wait to hug him...and be a whole family again! So even though we'll be joining another family at their home for Thanksgiving dinner, I wanted to share my table, all set for a celebratory Thanksgiving eve dinner. There's a craft too! Let's start with my table. 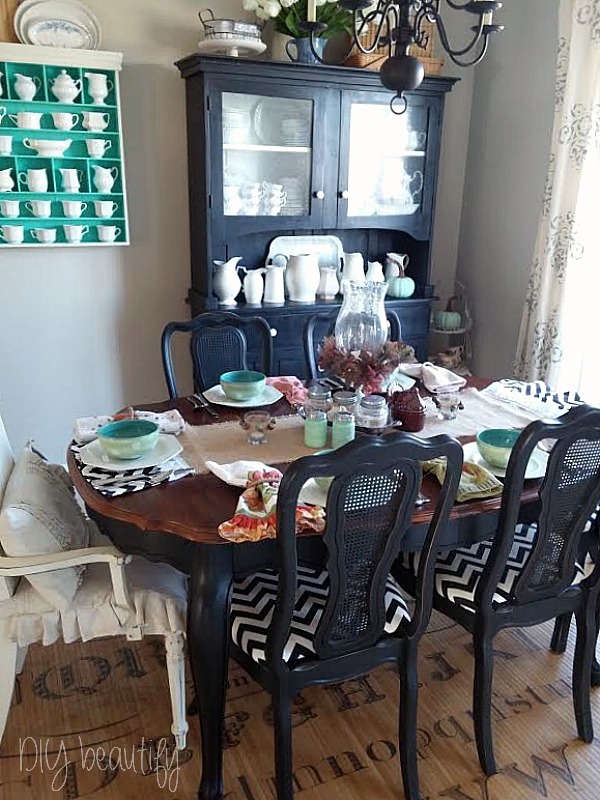 I've decorated with both traditional and non-traditional colors. I love the pop of color from the aqua and green bowls. I was thrilled to find these bowls at the thrift store recently. The green/aqua combo and polka dots fits my style perfectly. I paired the bowls with my ironstone dishes. I have a lot of ironstone dishes, collected over the years. I chose the octagon set because if I'm going eclectic, I might as well go all out with mixing shapes and patterns, right? 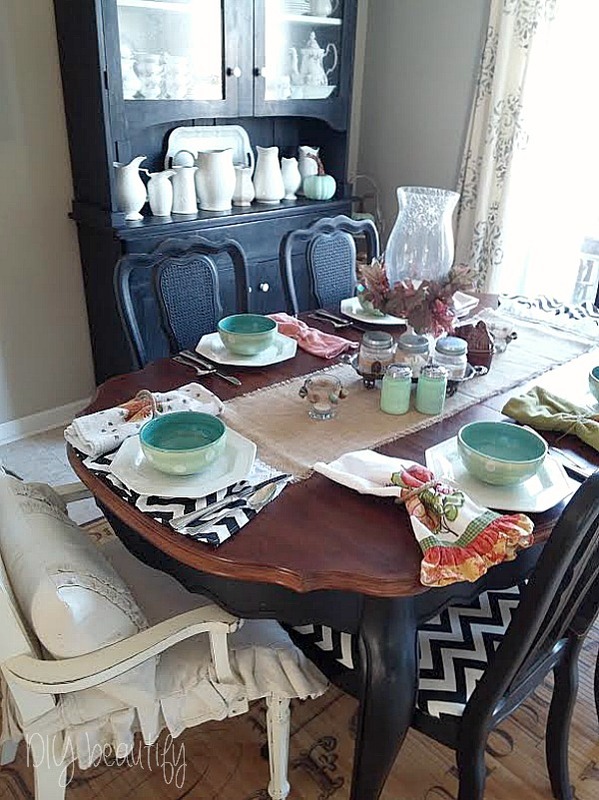 The foundation of the table is this handmade burlap table runner. 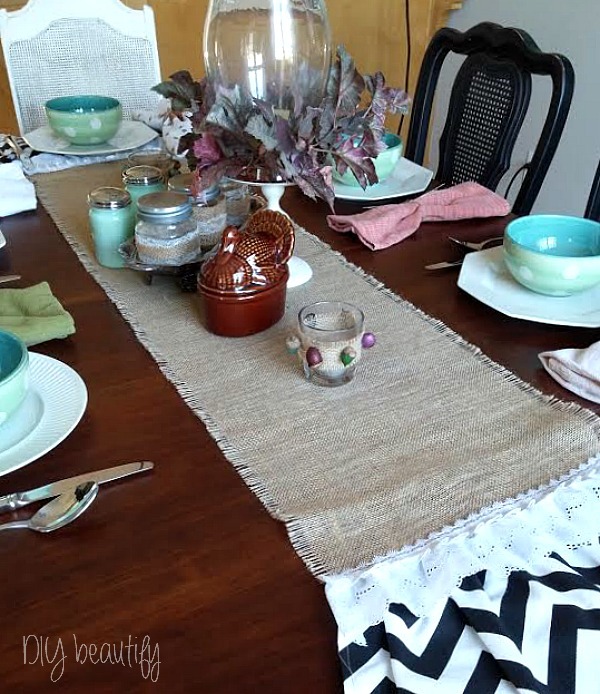 I'll be sharing more next week about how to make burlap table runners...so stay tuned. 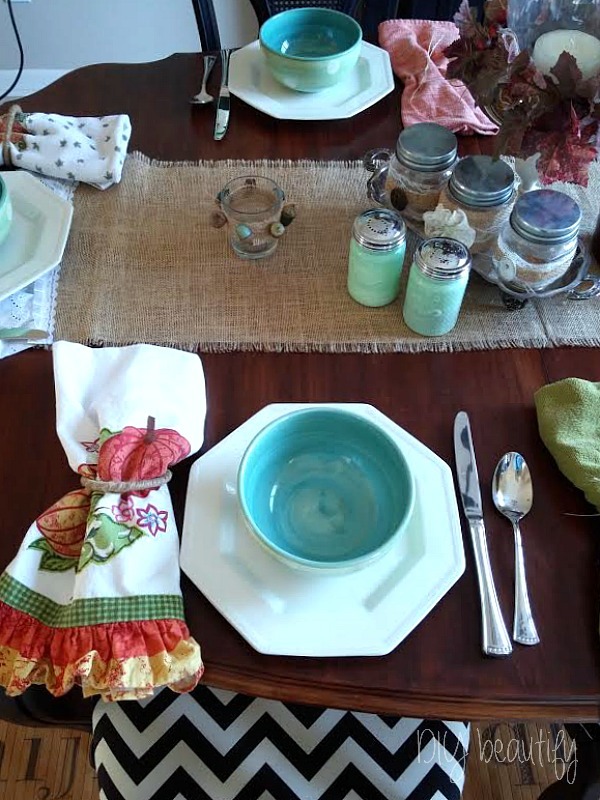 My Fall dish towels make perfect napkins for this eclectic look. I tied them with jute-wrapped plastic rings. We'll need big napkins because I'll be serving my homemade chicken tortilla soup in those great big bowls. Mmmm, delicious comfort food...and a recipe that the whole family loves. I'm a collector...I can't help myself. On a recent walk (while everyone else was walking), I was collecting acorns from the side of the path! I used my metallic BIC permanent markers (affiliate link) to color the acorns. The markers are juicy and coloring the acorns took no time at all. I even colored the acorn caps (after I hot glued some of them back on)! 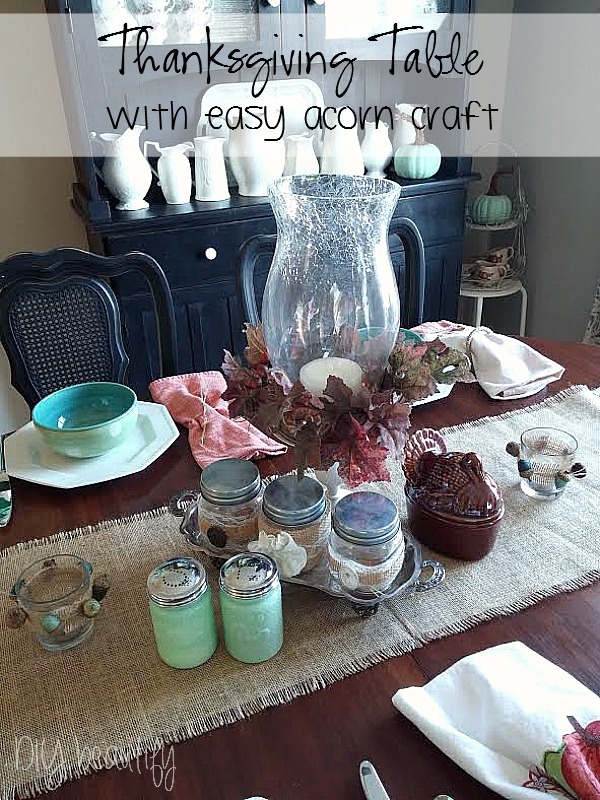 Then I wrapped glass votive holderes with burlap and hot-glued the acorns on. 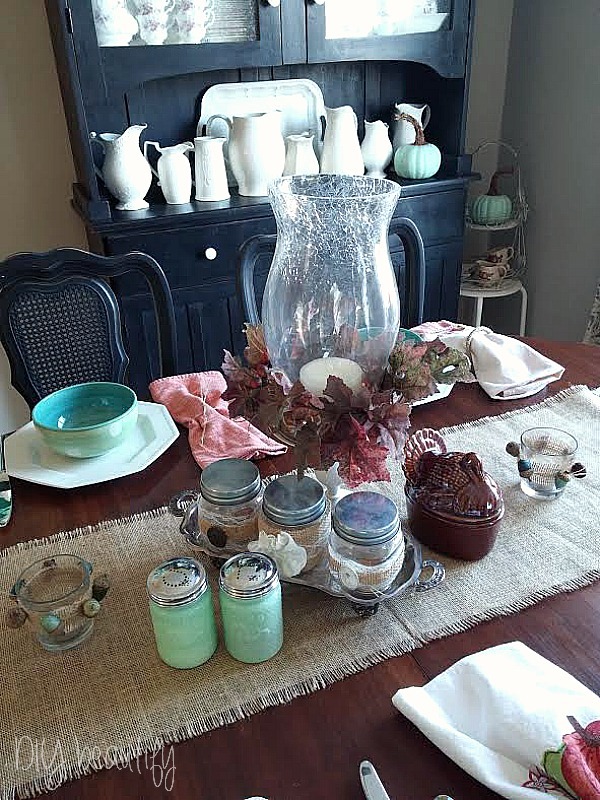 I made two acorn and burlap wrapped votives...and they look really cute on my eclectic Thanksgiving table, all ready to light up. I sincerely wish you and your family a Happy Thanksgiving from DIY beautify! I hope you take time to reflect on all your blessings!